The election campaigns have me pining back to more innocent times. Forty-seven years ago, when I was 19 and a literature major at the Sorbonne, I visited the London Krishna temple. If I had known then that a half-century later I would be writing a biography of Krishna guru, Bhaktivedanta Swami Prabhupada, I would have taken notes. That week, devotees were recording kirtans with my hero, George Harrison. When the young American and British Bhakti Yogis learned I played organ in a college band, they invited me to join them. We walked into Apple Studios, and there was George, sporting shoulder-length hair and neck beads. We recorded almost every day together for the next two weeks. That was it for me. I entered ashram life in 1969, and when I came out it was 1982. I have no idea what happened in the 1970s. I lost a decade. But I gained something priceless and have been happily a part of the yoga community in one form or another ever since. Let me be clear that I am no longer a romantic. My robes are safely stowed away in a closet, my wife keeps the only key, and she comes from a long line of diehard Republicans. Her vigilance aside, I see now what I was not ready to see as an idealistic teenager: that real yoga has a role to play in politics. In its deepest sense, to be a yogi means to contribute to the revitalization of a spiritually depressed humanity. The word itself signifies reunion with the Divine, with the source of spiritual empowerment. Now, words such as “God” or the “Divine” are tricky. George used to joke that as soon as you say the word God people break out in hives. So you are welcome to substitute some other term if you wish: higher wisdom, the inner Ringo, your own personal Obama, whatever makes you comfortable. 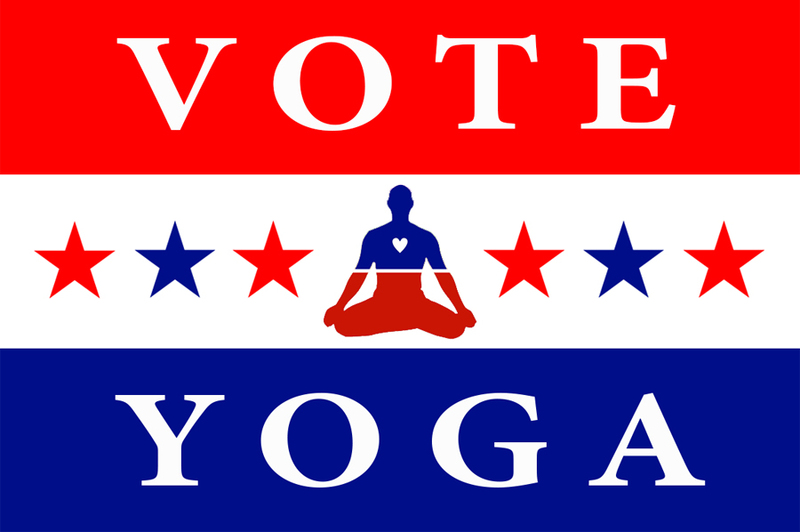 The point is this: yoga lies at the heart of all aspects of enlightened life, including politics. It may appear naive talking about spiritual affairs in regard to something as troubling as the current elections, but I’ve spent a fair amount of time in Washington and remember well the people I met in government—smart, most of them, but cautious about pushing the envelope too far or too fast. Politicians are uncomfortable talking anything transcendent: voters want profits, not prophets. Yet no lasting solutions to the world’s woes can be achieved if our leaders remain ignorant of what it means to be human. We are not the body or mind, says the Bhagavad Gita. We are eternal souls and the Divine dwells with us in our heart. Why is that important just now? Because the solutions that have been offered by candidates to the troubling issues of the world fail. They don’t work, and they would do well to listen to what yoga has to say about good governance. A government that does not recognize the divinity of life is destined to fail. Without acknowledging the transcendent dignity of all individuals, whatever their background or offense, democracy and freedom are nothing but empty words. History going back to the ancient Greeks has shown how any government that ignores the soul of its citizens sows the seeds of its own demise. Yoga is also important just now because yoga speaks to character, and character is in short supply. Consider the recession, which owes its genesis to the mentality of greed we saw operating in 2000. The Enron and Arthur Anderson scandals led to a series of laws called Sarbanes-Oxley whose purpose, in theory, was tighter control of corporate behavior. In practice, however, the new laws did nothing to curtail malicious business habits. As we now know from the repeat performances of 2008, all that the news laws did was make white collar criminals more cunning in circumventing regulations. You cannot legislate a change of heart. Laws don’t lead to enlightenment. But yoga does. The Bhagavad Gita tells us that knowledge of Divinity and the soul is raja vidya, the king of knowledge. Raja-vidya also translates as “the yoga of Presidents.” Real yoga can inform government leadership by encouraging a vision of all life as sacred and all beings as divine. Please know that we do not expect you to be the Avatar for the Age of Kali. But we do expect you to exhibit a yoga-like character and to listen as well as you have campaigned. We yogis have something to say and we’d like to be heard. Yoga has something to say about peace, that peace begins by recognizing the Self in all life, human and animal. Yoga has something to say about environment, that the Earth herself is sacred and deserving of respect. Yoga has something to say about recession, about fostering a simpler way of living and a higher way of thinking—very fuel efficient, very economical. There is really no end to the contribution we here can make, if we practice our yoga off the mat. Yoga Light or Yoga Heavy?